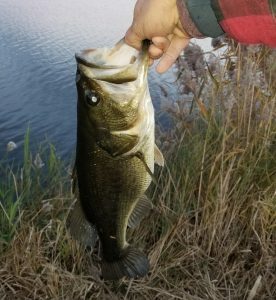 So, here we go again with year number six of the Top 5 project already off and running thanks to a West Central Illinois New Year’s Day bass. Yep, that’s right, open water on a non-power plant/cooling lake to start the year, rather unusual. Of course, that is only part of the equation as you also need to figure out how to get bit. Congrats to Jim Junk on getting it done with all the details below. Angler Comments: Didn’t really think I would be putting you to work this early in the year. 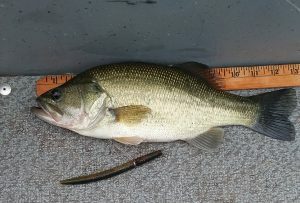 Healthy 3-3 Banner bass hit a Rat L Trap. If a New Year’s Day bass wasn’t cool enough, Jim had also landed a 2018 Christmas Day bass as pictured below, quite impressive. 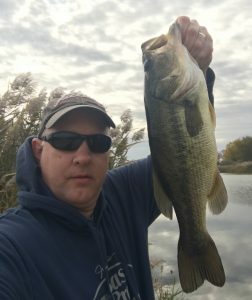 The Top 5 is an audience participation project for anglers to submit their catches for public consumption on what I like to call a virtual brag board. 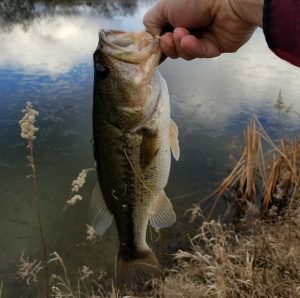 2019 marks year number six of the project and it’s been an entertaining addition to my fishing and writing hobbies as well as something to look forward to with weekly update postings each Monday and monthly updates of the running totals. While initially focusing solely on bass, beginning in 2017 the project was expanded to include other freshwater species. I will accept either weight or length data based on the angler’s preference so there will potentially be separate categories within species according to the information provided. One stipulation is that the fish be landed via rod and reel. 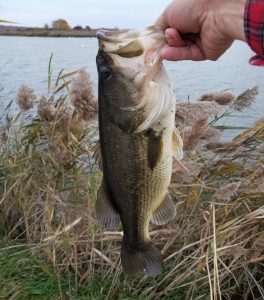 Bass will still remain a collective group for your Top 5 creel (largemouth, smallmouth, spotted or whatever other black bass species you might run into on a fishing journey somewhere) and must measure 12” or better to qualify whether submitted to the length or weight category. Don’t hesitate to send in some early members of your “limit” that you anticipate displacing later. It’s always fun to watch the progression in such instances and even the Bassmasters have to post some “dinks” along the way. I don’t really have any minimum criteria on other species at this point and I am leaving each species on its own. 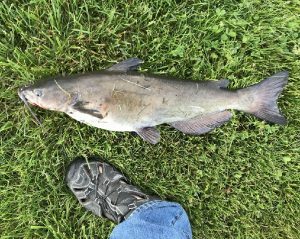 For example, the catfish family will all be separate, thus a flathead Top 5, channel cat Top 5 or even a bullhead Top 5 if that’s your specialty. 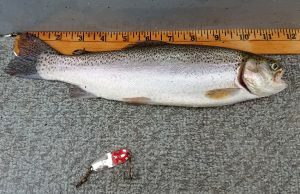 For those who elect to weigh their catch, while a digital model is preferred, if you still roll with a DeLiar and such, it’s all good as long as you can get within a couple ounces of accuracy (remember there is no big money check). We run on honor code. 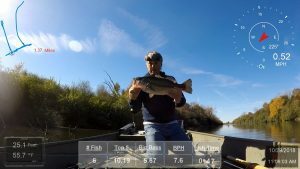 I shoot straight in terms of weight in all of my fishing reports and I assume others do as well. The amount of information you are willing to share is entirely up to you. I’m a more information the better guy but I get it if you’d rather remain somewhat elusive. 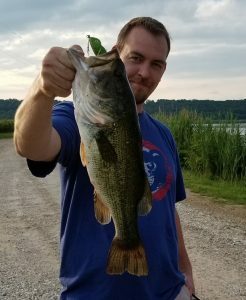 I have compiled a database of the 591 bass and handful of other species submitted over the years and it’s always fun to take a look at the record book. Thus, it would be cool to have it dialed in, but I’ll take whatever I can get. Weight/Length: I record weights in pounds and ounces such that 5-4 equates to five pounds four ounces as opposed to decimals so I ask that submissions be reported in this fashion to avoid conversion and/or confusion. For length submissions let’s go with the nearest half inch. Lures/Bait: if you aren’t willing to reveal specifics such as brand, model, presentation and color, a generic category such as spinnerbait, plastic worm or crankbait would be appreciated. Chicken liver, stinkbait, dew worm, cutbait and so on work just fine as well. Location: if you don’t want to say “Emiquon Preserve” just go with Fulton County and a designation of public or private would also be of interest. Even West Central Illinois strip mine or Eastern Iowa stream would be beneficial if you prefer not to be too specific. Date: can’t see much of an issue with this aspect but I guess I’ll just list it as the date I received the submission unless otherwise noted. Once again though, the more accurate the better in my book. Name: totally up to you whether you want to use your real name or a nickname, just let me know what you prefer. Photo: a pic is required so have your cameras or “phones” at the ready. After all, part of the premise of this entire project is to show more fishing pictures on the website than just my little bass. Whether you put your mug in the frame is your choice. Angler Comments: if you’ve got a story, something weird or otherwise interesting to pass along with the catch, by all means, include your tale. Same goes for structure as it’s fun to hear if the fish came off a point, alongside a laydown, amidst a patch of lilypads and so on. I will be happy to use your description, as written, in the periodic updates so don’t use any “bad” words, that way I don’t have to spend time editing. Step One: You catch, weigh/measure, document and photograph a fish that resides in your Top 5 heaviest of 2018. Step Two: Send your pic and details to troy@troyjacksonoutdoors.com. Step Three: I track the catches and photos in order to provide periodic updates (typically each Monday) as you build your Top 5. (Note: you send each fish as you work towards a Top 5 rather than waiting until you have five, unless, of course, you wipe ‘em all out on your first trip). Step Four: Repeat the above, replacing (or culling to use a tourney term) smaller Top 5 fish as larger ones join your ledger. For instance, say your Top 5 by May 1 is as follows: 3-4, 2-7, 2-3, 1-12 and 1-11 for a total weight of 11-5. Then on May 6 you reel in a 3-3 so out goes the 1-11 and the total weight bumps up to 12-13. Same concept for length submissions. No time to fool around with the annual Top 5 all-time record book look as the 2019 version is already off and running. This post and another tomorrow will get us up to speed just in time for Monday’s initial Top 5 Update of the New Year, the earliest start in the history of our project. As we await the latest, here’s a look at the numbers from the five year history of the Top 5. A fine batch of 116 bass in 2018 brought the all-time total to 591 bass submitted. 2018 also marked the second year of a Top 5 expansion to include other species and we added a half dozen more to the “Other Species” portion of the record book. We’ll kick things off there before moving on to the bass breakdown. Moving on to the bass, let’s take a look at how our fish stack up with respect to the calendar. Five years, 34 different anglers and 591 bass (all but 22 from Illinois waters) make up the all-time record book. Here we go. 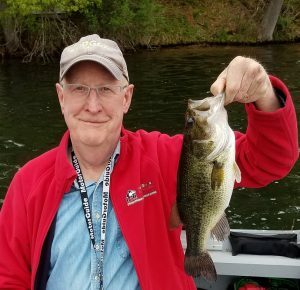 Comments: While Spring continues to rule the day in terms of submissions, a record batch of late season bass was a welcome change to extend the weekly updates in 2018. 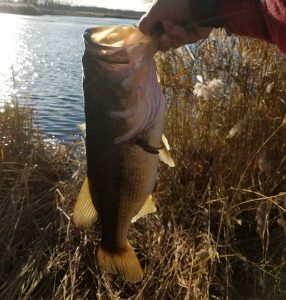 It can be tough to upgrade late in the year but those bass are definitely out there if you don’t put those fishing poles away too early. Mid-summer is still a bummer with the August haul needing a boost so don’t forget the dog days although they are a ways down the road. Comments: Takes nearly 28 pounds of combined weight from our anglers to crack the Top 10 all-time which is getting to be pretty tall order as we kick off our sixth year. Comments: Pretty cool to see one third of the calendar set new marks in 2018 kicked off by a full January creel to replace the former mark held by a lone 2017 bass. Crazy close on the year as well with three of the final four months getting a boost, good stuff. Another successful year of sharing fish stories in the book as 2018 gives way to a New Year. As always, we’ve got stats…and a Top 5 Champ to crown. So dive right in for the rundown of the numbers and blurbs as we close the book on 2018, year five of the Top 5. 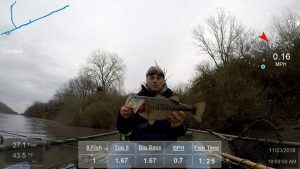 Comments: Ten bass by the end of February was a sight for sore eyes as you never know what the weather holds where most all of us Top 5 folks wet a line. I must say that March ended up as downer though with nary a submission. 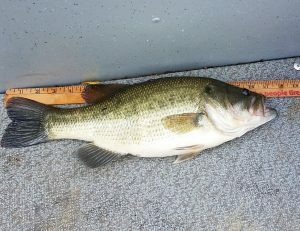 A strong finish to the year really pulled us through and included new record monthly totals among those last 48 bass. Comments: Record breaking bookends on the calendar were a cool feature and prove that you can still get it done in cool water. An outstanding batch of bass during the final three months of submissions included all of the Top 10 bass for the year (more on that later). Comments: You know, it kind of does my heart good to see a breakdown such as this. I’ve spent my share of time in both spots, still do. Both have their merits and the latter of the two is a necessity by rule on at least one of my stomping grounds. While the boated bass outweighed the banked bass, it certainly was an impressive batch for the bunch that prowled the banks. A boat definitely alleviates that old “sure wish I could get over there” feeling but the limited access of the bank can also pay dividends. That limitation can force you to slow down, work your spots thoroughly and maybe hit them a second time on the way back to the parking lot. Comments: Even if you’ve got more than enough fishing holes to choose from do you ever wish that you had some more private honey holes? Sure, but those can be hard to come by these days. Thus, it’s fun to see the results that the Top 5 crew produced by spending a lot of time fishing where everybody can fish. Comments: What can you say about the good, old plastic worm? Presentations may have changed as wacky rigging ruled the day amongst our anglers, but these things still get it done. 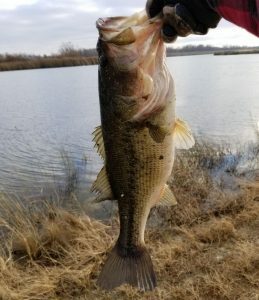 Several new records are also established in 2018 and it took some darn good bass to set the marks. Comments: The new monthly Top Bass to begin and end our year were each part of their respective monthly Top 5 record books. Lots of folks can catch them when the conditions are favorable while January and November can kick up the challenge just a notch. 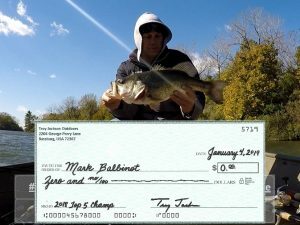 Comments: In a case of “saved the best for last”, the final submission of 2018 turned out to be the largest bass of the year. It also managed to crack the all-time Top 5 Top 10 list which is a pretty tall order these days as it takes a near 7-pounder. Comments: Congratulations to our 2018 Top 5 Champ, Mark Balbinot, whose strong finish propelled him to his third straight winning weight. All told, 13 anglers posted our 116 bass as well as the species to follow below. Comments: The Top 5 expanded to include species other than bass back in 2017 and the contributions have been rather slim with just over a dozen non-bass in the database. However, it’s good to see that there’s other fish in the lakes, ponds, rivers and streams than those crazy bass. It’s always a treat when one of those “others” shows up in the Inbox with this year’s newcomer being the rainbow trout. There you have it. The Top 5 turned five with a solid and rewarding batch of catches from some boys and a girl spanning the age spectrum from youngsters to considerably more “experienced” youngsters. The 2018 totals of 116 bass and 6 others represented a welcome boost from 79 and 13, respectively, in 2017. So, you know what? We’re going to do it again in 2019. A hefty batch of bass as a late season arrival provide us with at least one more update before we bid farewell to 2018. If this is indeed the conclusion it sure is an impressive finale. 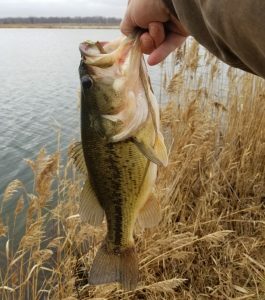 Open water is disappearing in my neighborhood and with it go my hopes of hitting my annual goal of a November bass. However, another of our Top 5 anglers continues his impressive run with a couple more submissions. It takes some work these days to get it done so here’s a tip of the stocking cap to Jim Junk for keeping us going. 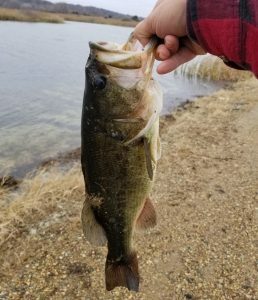 Angler Comments: Didn’t have very high expectations when the place I wanted to fish was ice covered and the past two times out had been limited to one small bass. Found some open water though and these two, 3-11 and 4-0, both on a chatterbait. The weather in West Central Illinois has taken a dip in the cold direction and even featured a measurable snowfall last week. 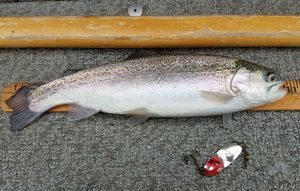 But a couple anglers have still managed to get out there and fool some fish, including the first pair that add another entry to our “Other Species” category (meaning something that’s not a bass). 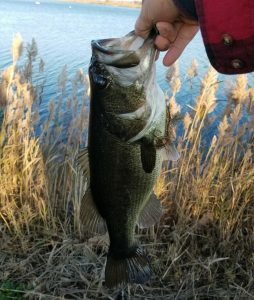 Angler Comments: Ended up with two bass on a lipless crank, big one was 3-10. Angler Comments: Six more bass with a pair of 4-pounders. All on lipless crank. Pulling it through weeds, pretty classic, hits came right after pulling it through a weed. Ten months down for 2018 means it’s time for another stat update. Without further ado, here you go. Friday Flashback series continues later this week and yes, we do have a couple interesting additions to the Top 5 ready to go for Monday. Anybody else willing to brave the elements around West Central Illinois to add to the collection? Monday updates live for another week as a couple anglers keep on casting as the days get shorter for 2018. Great to hear that these guys are still getting out there looking for one more bite, gives me something to write about that pretty much writes itself. 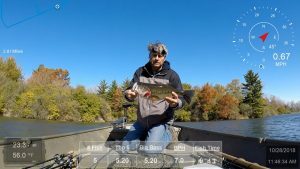 Angler Comments: On the board with five solid November bass including big bass of 3-13.